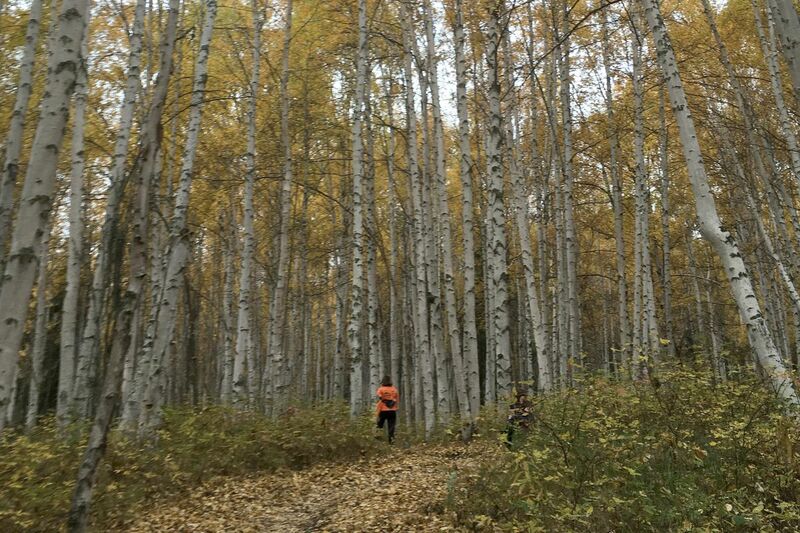 The Equinox marathon in Fairbanks exemplifies why I love Alaska. I suspected this going into the race. "You'll love it, the people are amazing," a friend told me. "It's fall, your favorite season, and it's just so incredibly beautiful that time of year in Fairbanks," said another. And: "The course is gorgeous. You won't even notice you're racing. Well — there's one big hill. But other than that, you'll be distracted by how pretty it is." With 3,285 feet of elevation gain on the 26.2-mile course, the Equinox is considered one of the most difficult marathons in the world. That didn't stop me and more than 1,000 of my closest friends from signing up this year for either the marathon or the marathon relay. I was daunted going in. After getting sick for a couple of weeks at a critical part of my training, I felt like I needed to reevaluate my goals and be OK with taking it even slower than my normal slow. Walk hills, take in the people and the course, enjoy yourself — these were my race day mantras. At the very start of the race on the University of Alaska Fairbanks campus, I cursed the short, steep uphill start. Luckily, a friend advised me that this was probably the steepest grade on the entire course. Also, lucky for all of us, the weather was perfect for running. The day dawned in the low 40s with the promise of a comfortable high of 61, with enough sun to reassure me it wouldn't rain but not too much to make it hot. I had already confessed to my husband that if the day dawned in the high 30s and raining, I would say I had a nice time training and bail. But I had absolutely no reason not to run. At 8 a.m. a cannon boomed, startling me, and we were off. There were three things that immediately struck me. First of all, I don't know if you've met Fairbanks in the fall. But it is absolutely magical. Birch and aspen trees turn brilliant yellows that make the woods glow in the cool air. Once you get a little higher, you see entire rolling hills lit up in soft and spectacular gold. Closer to the ground, the alpine plants turn crimson. It's an overall breathtaking sight — or, if you're in the middle of the run like I was, it's a welcome visual respite from pain and a reminder that some insane things in life are worth doing. Secondly, the people of this race are legends. I don't know all of them. But from the incredible humans who persisted, some at gallops and some (like me) at shuffles, through what is often a brutal course, to the supporters and organizers who turned out with signs, cowbells and beverages ranging from sports drinks to IPAs, there was the spirit I find across Alaska but is seemingly condensed in Fairbanks. It is a casual, modest kind of badassery. It is a man running in front of me in Converse All Stars. It is the proud mom who was crushing her first 10-mile run. It was the two young men who could best be described as "bros" based on their whooping and hollering, who were clearly in some pain but always had enough energy to check in on each other, offer encouragement to others and say breathless thank yous to volunteers. The atmosphere was overwhelmingly positive, a direct result of everyone who gave a part of themselves to the race. Finally, that course. It was a race that only an Alaskan would rubber-stamp as viable. I was glad I had friends who clued me in on some of the more notorious sections so I could mentally prepare. First, they told me, there would be a swampy section with leaves obscuring roots that exist only to trick and trip runners. Then, after mile 9, would come the big climb up 2,310-foot Ester Dome. Luckily I live in Palmer, where most trails I'm used to don't bother with switchbacks. The single track up the side of the Dome was nicely graded. Then, after the haul up Ester Dome, I would encounter a brief but soul-crushing segment of trail requiring me to run partially down again, only to turn back around. This was true, but thanks to some delightful homemade muffins at the turnaround, I dug deep and found the fortitude to press on. Volunteers cheered me on at mile 17: "It's all downhill from here!" they said. They were right, and the downhill started in the most Fairbanksian way possible with a journey of about 600 yards down a harrowing, nearly vertical run down the Chute. Again, breathtaking views, but also a breathtaking grade that slowed me to a jog to maintain ample footing while not destroying my quads. At the bottom of the Chute, I cruised past a howling man who apparently had not been training on the kind of relentless, straight-down Valley trails that were my day to day. All in all, I probably hiked about a quarter of the race, and ran or jogged the rest of it. Toward the end, no matter how much I pushed, it seemed I couldn't ramp up my pace very much so I remembered my race-day mantra to enjoy myself. Around mile 23 there were musicians playing bluegrass whose music almost made me cry. Sure, it was endorphins, but also it was so kind of them to hang out by the side of the trail and simply play. The music was a welcomed break from senses flooded with the monotonous physical sensation of running. Finally, the end. Finish lines are always beautiful, but this one in particular made me smile as I crossed it. It was very difficult race, to be sure. But for me, it was a renewed connection to those parts of Alaska I love most: the jaw-dropping beauty of this place, the incredible people that live here, and the awesome stubbornness we embody in persevering despite difficulty while supporting one another along the way.